This week I’m talking about gender, being non-binary and gender stereotyping in a series of Pause For Thoughts for Laura James’ Early Show on BBC Radio Devon. There are 7 in total, so stay tuned. 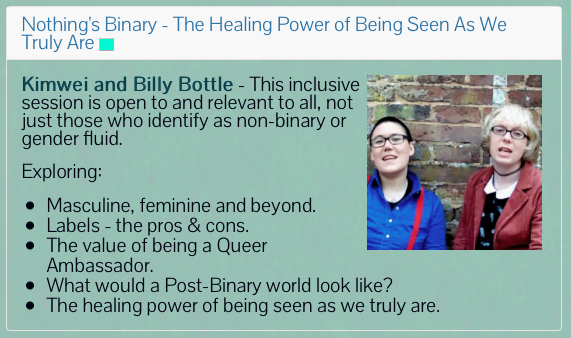 Billy and I had a wonderful time at Queer Spirit Festival doing a workshop on “The Healing Power Of Being Seen As We Truly Are”. It was a huge success and already we’re being asked to do more, so watch this space! Great news! 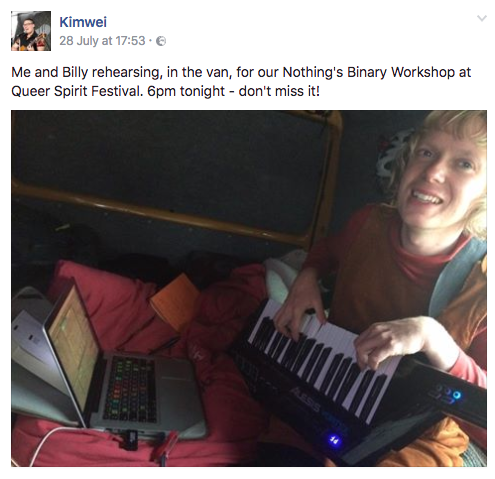 Billy and I will be at Queer Spirit for this workshop and will play a few songs to boot. Click here for more info. The video of my song “Nothing’s Binary” has reached over 6K in views and 100 shares on Facebook in less than a week. This vlog responds to the wonderful reception Nothing’s Binary has had, and to Piers Morgan on This Morning (16.05.2017) on the topic of gender. Please keep sharing the Nothing’s Binary video, also available on Youtube. SO happy that the magnificent Billy Bottle agreed to sing this song with me. They were/are fantastic on every level, and I’m very proud to present this video we created to co-incide with Exeter Pride. Our idea was to show us dressed the most masculine and feminine we both tend to dress. We’d love to make a collaborative video for this song with more people, in time for International Non-Binary Day on July 14th. Stay tuned. The song is about being non-binary, but also celebrating LGTBQ as a whole, this goes out to anyone who seeks to be seen for who they truly are. When we accept each other, we love each other, and when we love each other we change the world. So please, please share this video with someone who truly sees you / someone you truly see/ someone else. Billy and I would love it if you did. A first try at Daily Vlogging, I answer all manner of interesting questions from how to find your life’s purpose to how to spatch cook a chicken (if you are a newt). For music videos, check out the Kimwei Youtube Channel. It only takes 2 clicks and could get me to the live rounds in Poland this November. Vote with a YouTube ‘like’ (click though to YouTube and then click ‘thumbs up’)! It would also be fantastic if you would share the video on social media and encourage others to vote too. After Guitar Star last year (click here to view my appearance in Series 1, 2015 in which I got down to the top 4 in the acoustic category) I’ve decided it’s probably good to enter a competition every year. Guitar Masters 2016 is judged by an esteemed panel including Tommy Emmanual and Martin Taylor so wish me luck! Am proud to say this is my first 10min video shot in a continuous take (as stipulated by the competition rules) and although I was disappointed that the main camera came out a little fuzzy I think the dual-camera effect has worked well. Looking forward to doing more in this way, but with a better main camera. Hope you enjoy the pieces and please do press “like” (on youtube), share it with your friends and encourage them to press like too as it could make all the difference for me. In June 2015, Kimwei was featured on the Sky Arts TV show Guitar Star Series 1. Watch the latest video of the arrangement of “The Soundmaker” by Rodrigo y Gabriela that she created especially for the show. FULL arrangement, NOT available on Guitar Star.